Back when David and I were dating…when dinosaurs roamed the earth and we listened to 8-tracks in our Mustangs…we spent a lot of weekends at his mom’s house at the beach in San Clemente. His sister was living there at the time and most evenings we would all play Scrabble while drinking a concoction they called “Cactus Coolers”. Or was it “Citrus Coolers”? Okay, I looked it up. Cactus Cooler is a California-based soft drink. A citrus cooler was a couple of scoops of orange or lime sherbet in a glass with 7-Up poured over it. 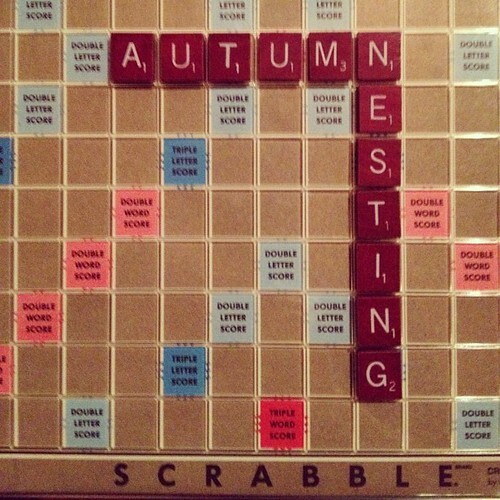 Those weekends were so much fun and I have very fond memories and associations with the game of Scrabble. A number of years ago I upgraded and bought this nice version of the game. The board rotates for easy viewing by each player. 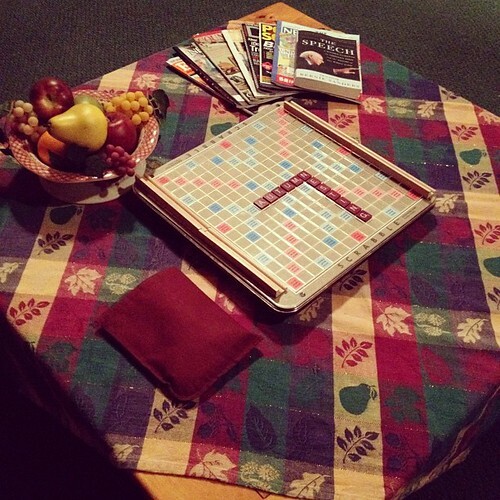 However we never seem to play it so I pulled it out and set it up on our family room coffee table. It might not be warm enough much longer for citrus coolers but coffee, tea or hot cocoa would be a nice treat while we play. What about you? Do you like to play games? What are your favorites?